The Middle Way or Middle Path (Pali: Majjhimāpaṭipadā; Sanskrit: Madhyamāpratipad[lower-alpha 1]; Tibetan: དབུ་མའི་ལམ།, THL: Umélam ; Chinese: 中道; Vietnamese: Trung đạo; Thai: มัชฌิมาปฏิปทา) is the term that Gautama Buddha used to describe the character of the Noble Eightfold Path he discovered that leads to liberation. In Mahayana Buddhism, the Middle Way refers to the insight into śūnyatā "emptiness" that transcends the extremes of existence and non-existence, the two truths doctrine. 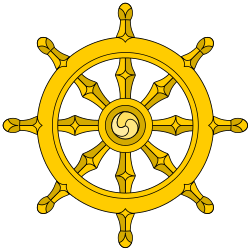 The term "Middle Way" was used in the Dhammacakkappavattana Sutta, the first teaching that the Buddha delivered after his awakening. [lower-alpha 2] In this sutta, the Buddha describes the middle way as a path of moderation, between the extremes of sensual indulgence and self-mortification. This, according to him, was the path of wisdom. According to the scriptural account, when the Buddha delivered the Dhammacakkappavattana Sutta, he was addressing five ascetics with whom he had previously practiced severe austerities. [lower-alpha 3] Thus, it is this personal context as well as the broader context of Indian shramanic practices that gives particular relevancy to the caveat against the extreme (Pali: antā) of self-mortification (Pali attakilamatha). In Theravadin soteriology, the principle of anattā means there is neither a permanent self nor complete annihilation of the person at death; there is only the arising and ceasing of causally related phenomena. [lower-alpha 5] Paticcasamuppāda also describes the Twelve Nidānas of dukkha "suffering" that leadi to rebirth, from avijjā "ignorance" to jarāmaraṇa "aging and death", and the parallel reverse-order interdependent cessation of these factors. ↑ See, for instance, the Mahasaccaka Sutta ("The Longer Discourse to Saccaka," MN 36 Thanissaro, 1998). ↑ See, e.g., Bodhi (2005), p. 315: "Several suttas hold up dependent origination as a 'teaching by the middle' (majjhena tathāgato dhammaṃ deseti). It is a 'teaching by the middle' because it transcends two extreme views that polarize philosophical reflection on the human condition. One extreme, the metaphysical thesis of eternalism (sassatavāda), asserts that the core of human identity is an indestructible and eternal self, whether individual or universal [...] The other extreme, annihilationism (ucchedavāda), holds that at death the person is utterly annihilated.... Dependent origination offers a radically different perspective that transcends the two extremes. It shows that individual existence is constituted by a current of conditioned phenomena devoid of a metaphysical self yet continuing on from birth to birth as long as the causes that sustain it remain effective. ↑ "Dhammacakkappavattana Sutta: Setting the Wheel of Dhamma in Motion". www.accesstoinsight.org. Retrieved 2015-12-30. ↑ Nāgārjuna (1986). Kalupahana, David, ed. The philosophy of the middle way = Mūlamadhyamakakārikā. Albany, N.Y.: State University of New York Press. p. 1. ISBN 978-0887061486. ↑ Harvey (2007), p. 58. Rhys Davids, T.W. & William Stede (eds.) (1921-5). The Pali Text Society’s Pali–English Dictionary (PED). Chipstead: Pali Text Society. A general on-line search engine for the PED is available at http://dsal.uchicago.edu/dictionaries/pali/. Retrieved 2008-01-03, the entry for "pabbajita" is available at http://dsal.uchicago.edu/cgi-bin/philologic/getobject.pl?c.2:1:1639.pali. Thanissaro Bhikkhu (trans.) (1998). Maha-Saccaka Sutta: The Longer Discourse to Saccaka (excerpt) (MN 36). Retrieved 2008-01-03 from "Access to Insight" at http://www.accesstoinsight.org/tipitaka/mn/mn.036x.than.html.